Current view is as of 06/19/02. To see a fantastic 360 degree panorama from the center of the room, click here. This view is from the far wall looking back at the entrance. You can just see the staircase in the background past the custom Olhausen Billiard table. 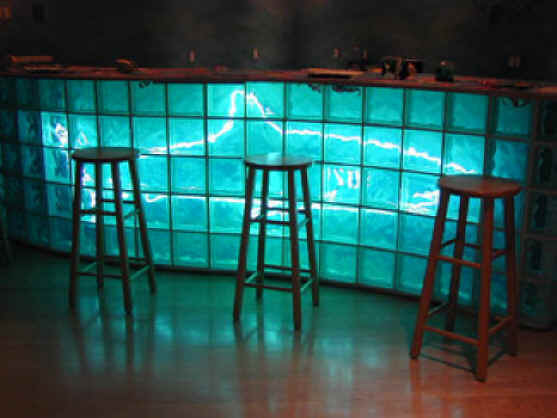 On the left is the bar with the eight foot neon shark. Here's a closer look at that bar area. A couple of notes here. 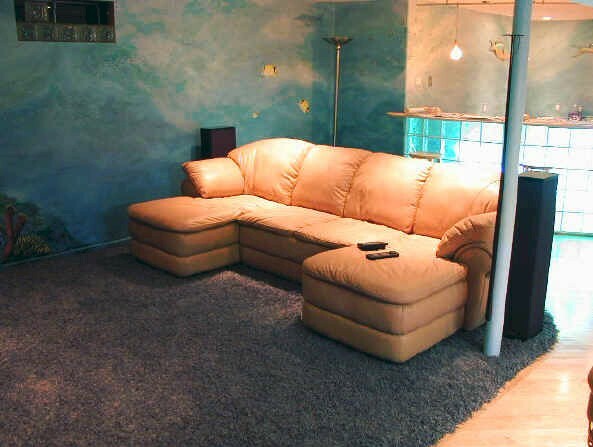 First of all, the carpet color is still not accurate. The sofa is finally here, although we could use a coffee table. The pole needs some work to help blend in. The window needs some glass block to tie in. 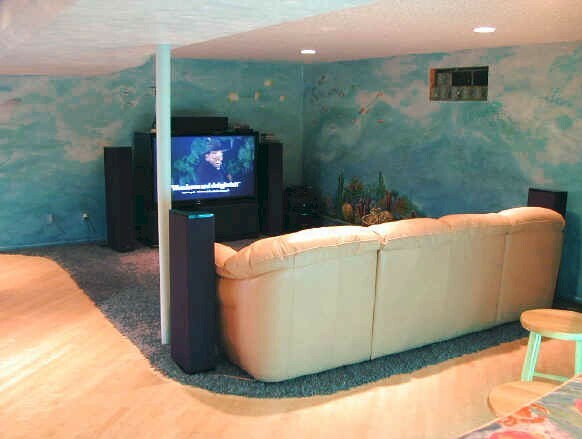 The home theater system, however, is perfect. (I wish I had pictures of those hard-working delivery guys from Tweeter getting the huge TV down the bulkhead steps.) The front three speakers each have built-in amplifiers and subwoofers that really open up the soundstage and shake the place. Very theater-like. If enough people ask for it, I'll create a page dedicated to this system. 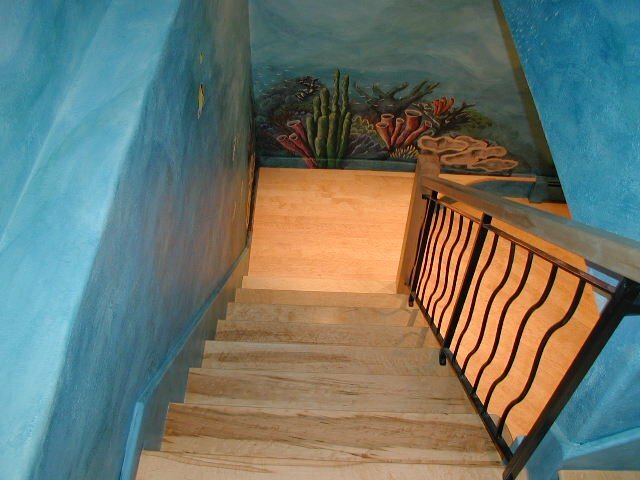 The stairs coming down into Atlantis are particularly interesting. 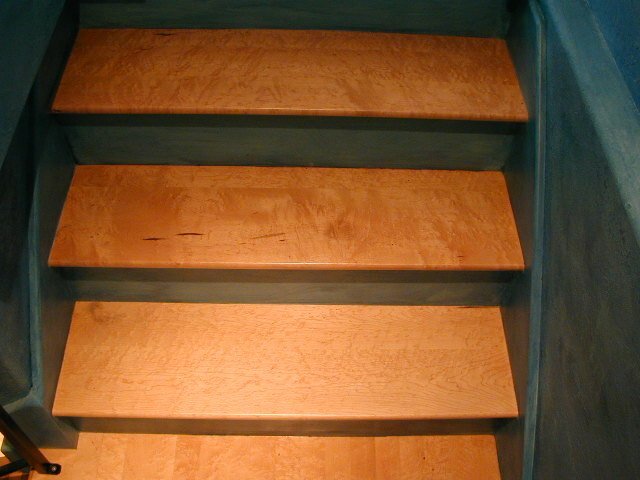 Each birdseye maple step was custom milled with matched grain and an unusual elliptical shape on one side. This elegant curve is somewhat visible in this picture, but is expanded on in the stairs page. There are all sorts of details that are worth looking at here and on the stairs page. 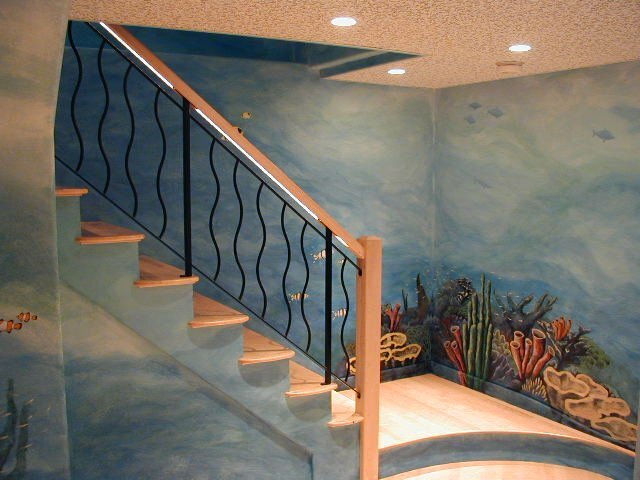 Note the custom wavy wrought iron balustrade, birdseye maple newel and lit railing, curved platform, and of course the fantastic coral and underwater painting seen on the fish page. Here's the view looking down the main stairs. The treads were laid out to get progressively lighter as you dive down to floor level. These are the top three steps from the main floor to a landing. I would've left it out but some of the most highly figured wood is there. Not bad, eh? Don't forget to visit the Stairs page to see the construction stages and possibly even visit the really detailed stuff! The neon shark is shown here. It turns out to be extremely difficult to get a correctly exposed picture of the shark without making everything else completely dark. Be sure to visit the Neon page to learn about how neon is created.